Scientists are investigating the flow of radioactive material through the Yucca Mountain in Nevada. To date measurements and models have assumed a classical, steady-state diffusion. The researchers wanted to test if this was an accurate assumption. As part of their experiments they took borehole samples, exposed one face of the rock sample to water or tracer solution and monitored the liquid uptake over time. Core samples of varying height to diameter ratios were used to investigate the shape effect. They hung the rock sample from a bottom-weighing analytical balance to measure the weight change during liquid imbibition. To regularly save the readings to computer disk, they downloaded the Windmill RS232 software. Windmill logged balance readings and to the computer at selected time intervals, starting with every second and increasing the interval as time went on. The Windmill software helped show that the steady-state diffusion assumed by previous models cannot be applied to the Yucca mountain. 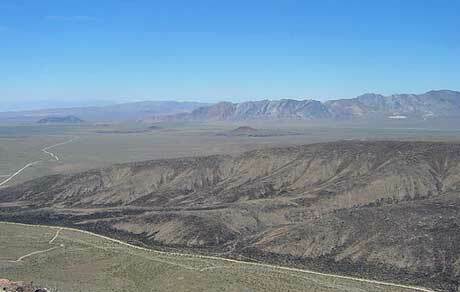 Yucca mountain is the site of a proposed storage facility for radioactive waste.